Maldives, a beautiful country with a pleasant climate and friendly people. 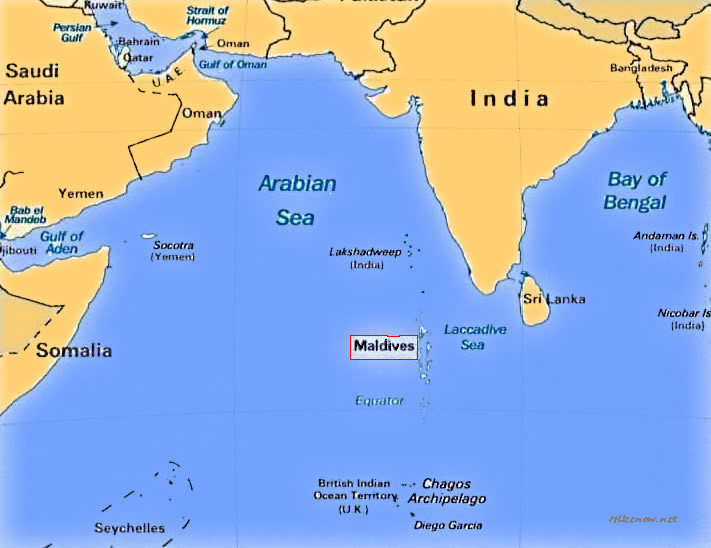 The Maldives are a group of islands spread over 90,000 square kilometers (35,000 square miles), making it one of the world’s most dispersed countries. There are close to 1,000 islands that make up this beautiful tropical country, with its golden sandy beaches, deep blue and crystal clear waters. Malé is the capital and the most populated city. It is said that a Moroccan, one Abu Barakat the Berber, was believed to have been responsible for spreading Islam in the islands back in the 12th century CE. The state religion is Islam and the country is a Muslim country with a Muslim president, government and military, may Allah preserve them. My visit was at the invite of the Salafi brothers (Al-Maktabah As-Salafiyah Maldives) based mainly in Male and also in the closest island to the capital, Hulhumale, which is where we stayed for the most of the trip. It is from there that we would commute by speed boat or ferry to the capital, Malè, daily for the lectures. The noble brothers in the Maldives had been inviting me to visit for a series of lectures for several years, yet other commitments had always prevented me. The Salafis have with them a resident Maldivian graduate from the Islamic University of Madinah, Abu Anas Muhammad Hasan (hafidhahullah), who is very active in translating, teaching and cultivating the Muslims in the Maldives. The brothers with him are also active in calling to Tawheed and the Sunnah through “Maktabah Salafiyyah MV”. They have published several translated works of the scholars such as the writings of Shaikhul-Islam Muhammad Ibn Abdul-Wahhāb, Shaikh Ibn Bāz, Shaikh Al-Fawzān, Shaikh Rabee’ and Shaikh Abdullāh Al-Bukhāree. They have a small day school (which needs our support) where children are taught Islamic beliefs, rulings and manners. I myself have heard Shaikh Ubaid al-Jābiree and Shaikh Abdullah al-Bukhāree praise the efforts of our brother Abu Anas and those around him. 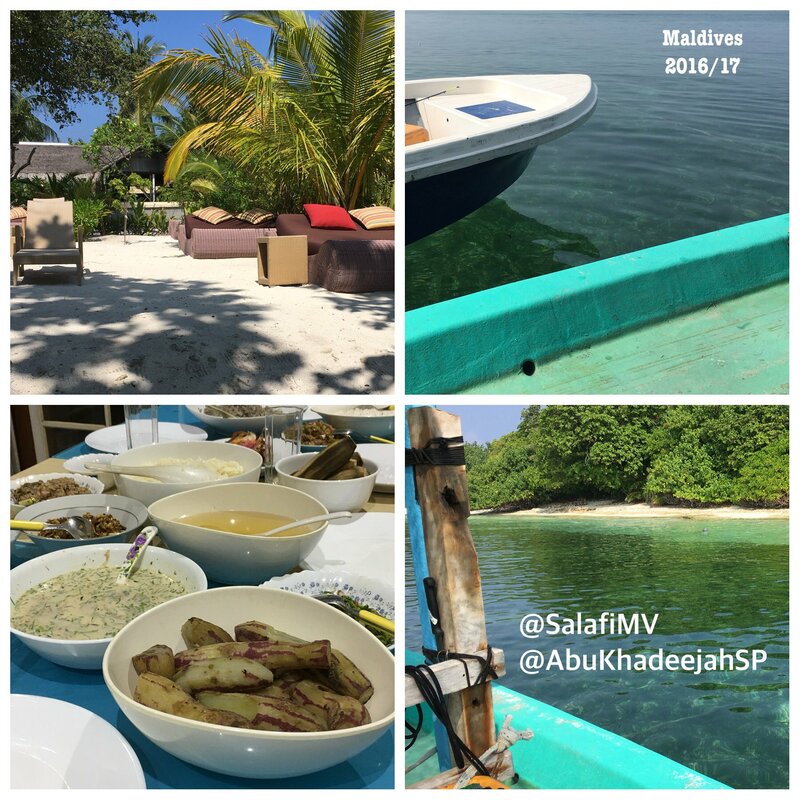 Others have visited the Maldives before me for the purpose of da’wah: Shaikh Abdullah al-Bukhāree (Madinah), Shaikh Muhammad Ibn Ghālib (Dubai), Abu Mu’ādh Taqweem (Nelson UK) and Abu Idrees Muhammad (Birmingham UK) – so may Allah reward all those who preceded me. My particular trip was for the purpose of lecturing on the subject of the hallmarks of Ahlus-Sunnah wal-Jamā’ah, its distinguishing characteristics that remain unaltered since the time of the Prophet (ﷺ) and his Companions (M) till this day, alongside a strong emphasis upon rebutting the ideas of the extremist, revolutionary and terrorist groups (Khawārij and Rāfidah Shi’ah) who have distorted the revealed texts, and thus maligned the beauty of Islam in the eyes of Muslims and non-Muslims alike. The organisation of this event which lasted six days with daily classes followed by extensive question and answer sessions broadcast across the Maldives and worldwide through the internet, using all the social media platforms available to the brothers (and sisters) required a great deal of planning and organisation. I ask Allah to reward the brothers and sisters and their families for fulfilling this weighty task: Abu Anas, Abu A’isha Mu’ādh, ‘Ali, Isma’eel (the social media coordinator), the other Ismā’eel, Āsif, and the list goes on and on. Likewise may Allah reward those who cooked and provided the food for hundreds of attendees at the venues; and those who coordinated with the authorities; and those who made our entry and exit through customs easy, and those who arranged the various means of transport for myself and my family – may Allah preserve them. The lectures began in earnest in Malè the day after we arrived and I was pleasantly surprised by the large turnout, and even more pleased with the attentiveness of the audience, many of whom were taking notes. I was also amazed at the variety of the audience: locals from the capital, guests from far off islands who had travelled for several hours by boat to attend the lectures: there were also members of the police, the military and local businessmen. All of this brought joy to the hearts because it is an indication that the da’wah is spreading and getting stronger in the Maldives. The brothers decided on several important topics and equally important questions that needed clarity. As a result we received positive feedback from government officials and dignitaries, may Allah bless them. Q&A: Did Muhammad Ibn Abdul-Wahhāb & the Saudis rebel against the Ottoman Empire? Is that a justification for rebellion & protests today? Q&A: What is the comprehensive ruling concerning photographs on #socialmedia #avatars #selfies etc? Does it agree with Prophetic guidance? Q&A: What is your advice to youth in our times who busy themselves with social media and #ISIS propaganda? Q&A: Can Muslims visit non-Muslims in their homes? Q&A: Will the Angels gather in Mosques where there are graves, to invoke the mercy of Allah upon those who remember Him therein? Q&A: Is it allowed to attend the funeral rites of a non-Muslim? What can be done instead? Q&A: Is it allowed to pray in a Masjid wherein there is a grave or a Mosque that is surrounded by graves? Q&A: Is #ISIS #DAESH considered to be a state (dawlah) or a legitimate government? Q&A: Is it allowed to pray behind those who carry the ideology of the #Khawārij? Q&A: Under what circumstances is it allowed to rebel against the likes of Bashar Asad in Syria? Q&A: Is it allowed to demonstrate and march in the streets against the rulers when you see tyranny and oppression? Q&A: Is there #Jihad now in #Syria and #Yemen against the terrorist insurgents and who is carrying it out? Q&A: There are those who say “don’t get angry with Ahlul-Bid‘ah because at least they are Muslims unlike the Christians”? Q&A: Can a person fight alongside the Muslim coalition against the terrorist insurgency of #ISIS #DAESH? Lecture: The stance of Ahlus-Sunnah, the Salafis, towards the proliferation of groups and parties, and the effects of bid‘ah upon unity. Q&A: What is the current situation in Syria? How did it get there? Who was responsible? What is the position of the Salafi in the aftermath? Q&A: A women separated from her husband as he was an #ISIS #Khārijī. Her young child had kidney failure, should she return to her husband? A photo taken by an indoctrinated Khārijite and posted on Facebook claiming we are agents of the West! Q&A: How do we deal with graduating students from the University of Madinah who oppose the Salafi Manhaj and call to bid‘ah? There is, as one can see from the questions posed, a small but vocal body in the Maldives who carry the ideology of ISIS (DAESH), Lashkar Taibah and Al-Qaeda, and call to it. Some young people have been indoctrinated by the extremism of these ignorant callers. A few were deceived to the point that they travelled to Syria to join ISIS – where they have been killed fighting for this un-Islamic group. 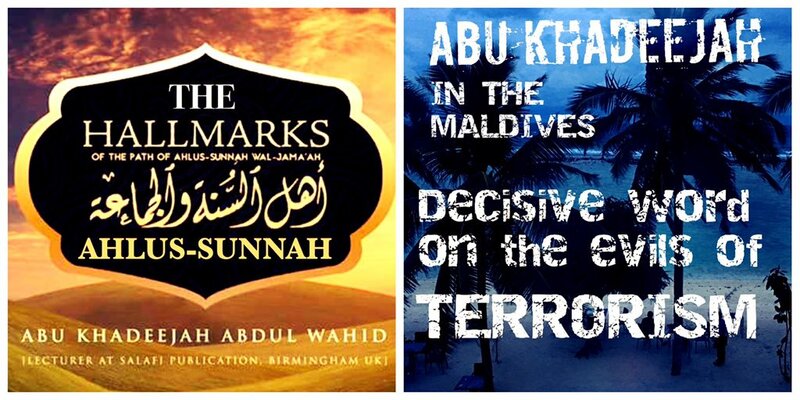 When I arrived in the Maldives, a group of these deluded political agitators and Khawārij became angered because they knew the the purpose of the lecture series – so they spread falsehood, confusion and negative propaganda against the conference, the Salafi brothers and myself in order to warn people from attending the classes. They accused me of being an agent of the unbelieving Western nations! They took a picture of a small group of us after prayer in a masjid in Malè on the first day and posted it on Facebook in order to warn against the lecture series – one of them declared me to be an unbeliever (kāfir)! Such was the fear they felt from our presence. Alhamdulillāh, their negative speech only bolstered and increased the attendance because people are sick and tired of the extremists and political agitators who are known for street demonstrations and anti-government rallies wherein they rabble-rouse against the Muslim ruler of the country. I’ve see photographs of these political agitators gathering veiled women in the streets making congregational supplications against the ruler! They take much of their revolutionary ideas from Western political thought, Marxism and Communism yet they accuse us of being “agents of the West”! 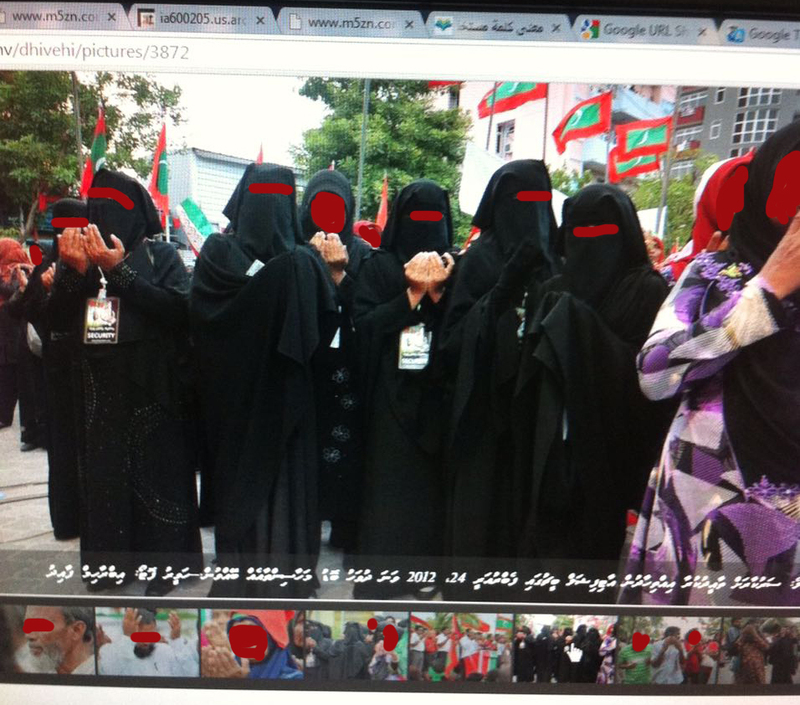 Women in the Maldives encouraged by political agitators to march against the ruler. Lecture after lecture brought more and more clarity to the people, and all praise belongs to Allah. I read constantly from the writings of the great scholars, past and present, such that the people comprehended and accepted the truth. I included readings from the great scholar Ibn Taymiyyah (d. 728H) wherein he clearly warns against rebellion and displaying public outrage against the ruler regardless of whether he is pious or oppressive. I explained the methodology of the early Salaf in how they understood the texts of the Qur’an and Sunnah and how that in turn brings about unity of the Ummah, stability, brotherhood and peace. I was amazed and humbled in equal measure at the response of the audience and we constantly took note of feedback from young and old, male and female. That gave me the opportunity to develop ideas for the following lectures. Abu Anas Muhammad Hasan and Abu A’ishah Mu’ādh were a constant help in explaining to me the challenges faced by Muslims in the Maldives and how the political agitators had tried to hijack the Islamic call and distort its pure message. Some of the places we visited and local foods we were introduced to. All of this should give the reader a taste of what was achieved in the Maldives in terms of da’wah and clarification of the truth, refutation of Ahlul-Bid’ah and the Khawārij, a defense of the Muslim scholars and rulers, and the basis of the unity of the Muslims. We took time out to answer questions about raising an Islamic household and inviting people to the beauty of Salafiyyah with excellent manners. 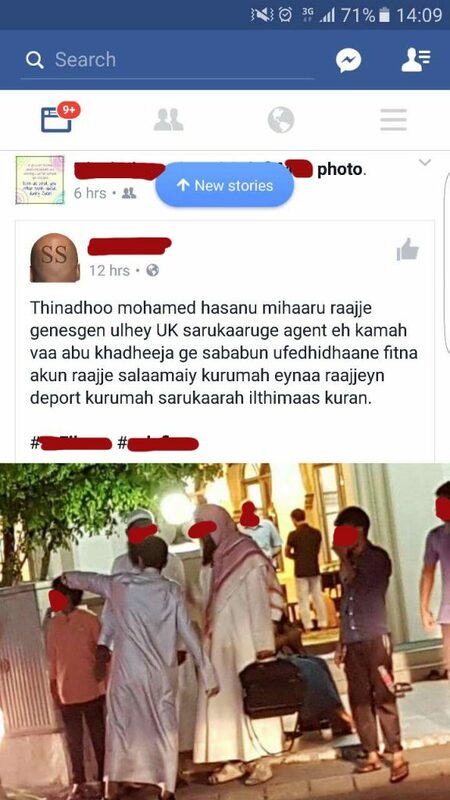 I found Maldivians in general to be very receptive to the da’wah once it is explained to them. We can only thank and praise Allah, the Mighty, Majestic and Kind for giving us the opportunity to meet our brothers and sisters in the Maldives who along with their families showed myself and my family hospitality that was overwhelmingly kind, generous and heart-warming. Myself (and my brothers from the students of knowledge) never seek wages whenever we travel for da’wah, alhamdulillāh. Yet our brothers provide such hospitality and companionship that surpasses the bonds and relationships of the world. These are ties of brotherhood established for the sake of Allah and Salafiyyah. The brothers and their families showered us with pleasant gifts (chocolates, perfumes, souvenirs, etc) as a sign of their love and affection for ahlus-Sunnah. After each of the lectures local families would invite us for dinner either to their homes or to one of the good restaurants on the island. After the lecture series was over the brothers had arranged for us to see the beauty of the Maldives that Allah had blessed its people with, so we travelled to a secluded island with a group of families, to experience the wonders of Allah’s creation. The Muslims of the Maldives have a lot to thank and praise Allah for, and then they should thank their rulers and government who do not prevent them from practising their religion, and cultivating and caring for their families. They are in a land of Islam and Muslims; a land of peace and security; they live in reasonable prosperity; the Adhān is heard five times a day, the Religion of Allah is practiced openly – so we ask Allah to strengthen this land further upon Islam and the Sunnah, and to make it more prosperous – and to guide its people and its rulers to His pleasure. Finally, the Salafi brothers and sisters in the Maldives should be commended for their steadfastness upon the Book and Sunnah, and for holding firm in these difficult times. They face opposition in their land (and elsewhere) from the callers to innovation, partisanship and sectarianism, but still they remain united upon the truth, alhamdulillah, so may Allah preserve them. We see them attending the seminars in Madinah with our scholars alongside hundreds of others who gather for the “Salafi Publications Madinah Dawrah” each year from around the world. The Salafi community in the Maldives is still relatively small and they are working hard to spread the da’wah and to cultivate their children. I ask every Salafi to extend his/her support to the brothers in the Maldives to help them establish a Salafi Madrassah and Learning Centre. Please contact me (or the Salafi Bookstore in Birmingham) for details on how to help them financially. I ask Allah, the Most High, to bless Ahlus-Sunnah in the Maldives, to strength the da’wah of Ahlus-Sunnah there, to protect the rulers from the evil intents of the political agitators and the Khārijite extremists, and to guide us and them to His pleasure and the pure Sunnah, the clear proof that our Prophet (ﷺ) left us upon: its night is like its day, such that none strays from it except that he is destroyed. And all praise is for Allah, the Lord of the worlds and may the peace and blessings of Allah be upon His Messenger, the Companions and all those who follow them precisely. Praise Allah subanahu wa ta’ala for your successful trip. I followed the lectures on whatsapp from the Caribbean and was greatly edified by your always erudite presentations. Brother Aamron also sends his salaams.